Consumers around the world are becoming more mobile. That is, more consumers are relying on mobile technology to operate in their daily lives. Mobile technology has made many aspects of people’s lives more convenient, such as social interaction due to their constant connection to the Internet. Commerce is also being revolutionized by mobile technology and people’s growing need for convenient service. More consumers are beginning to look for alternatives to traditional, physical stores, and many have turned to mobile commerce and e-commerce. Mobile consumers are turning to the Internet to find the products and services they want to pay for. As more consumers look online, retailers are feeling the pressure to adapt or risk losing contact with a growing portion of their audience. Thus, businesses are looking for ways to close the gap that currently exists between the online and offline worlds. Few retailers are willing to abandon physical stores, so many are attempting to provide consumers with incentives to visit these stores throug h the use of mobile commerce. 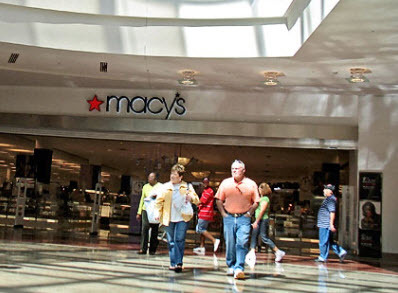 Big name retailers, such as Macy’s and Nordstrom, are working to make use of digital technologies in order to provide consumers with better in-store service. These companies have been working to broaden their reach through mobile commerce and e-commerce and, as a result, have been seeing declining in-store sales. Some consumers have even begun gravitating to online shopping platforms that are offered by other companies. This competition is driving innovation in the retail industry as companies attempt to find the best balance between mobile commerce and traditional forms of engagement. A recent study from Internet Retailer, called Mobile 400 Guide, shows that mobile commerce is growing. The study predicts that mobile commerce sales will double in 2013 as more consumers gain access to smart phones and mobile devices that are capable of facilitating mobile transactions. Retailers are feeling the need to find ways to engage consumers that are becoming increasingly enthralled in the world of mobile technology. Yihaodian, a Chinese e-commerce company, has announced the opening of 1,000 virtual stores throughout China. These supermakers will inhabit empty spaces within cities, but will not have any physical products stored within. Yihaodian will make use of augmented reality in order to accomplish this task, enabling consumers to access a massive, interactive database of goods. Once completed, this will be the largest virtual shopping network of its kind in the world and could help spark similar initiatives in other countries. Yihaodian is not the first company to attempt to establish a virtual marketplace in the real world. Others have made use of QR codes or NFC tags to accomplish this task in the past, but have been met with only modest and short-lived success. Yihaodian hopes to exploit the rampant popularity of augmented reality as a way to provide consumers with high quality service and ensure that the virtual supermarkets get the attention they need to become a success. The supermarkets will be called Unlimited Yihaodian. The virtual stores will be located in 1,200 square meter rooms that will have a digital stock of over 1,000 items. Consumers will be able to see these products using a smart phone equipped with an augmented reality application. Purchases can be made using Yihaodian’s e-commerce platform, enabling consumers to skip long lines and get what they want in an efficient manner. Like other virtual stores, consumers will receive their products in the mail after purchase, usually the following day. 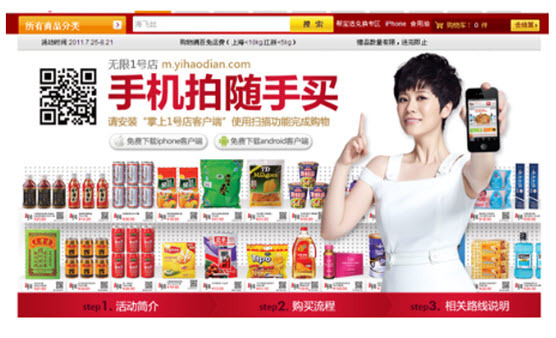 Yihaodian had attempted to bring virtual stores into the mainstream using QR codes. This endeavor proved informative, but largely fruitless. The United Kingdom’s Tesco had also launched a similar initiative in South Korea, where consumers were able to make use of QR codes to purchase products. This too was short-lived, with Tesco quickly taking down the virtual storefront and pursuing other avenues of e-commerce.